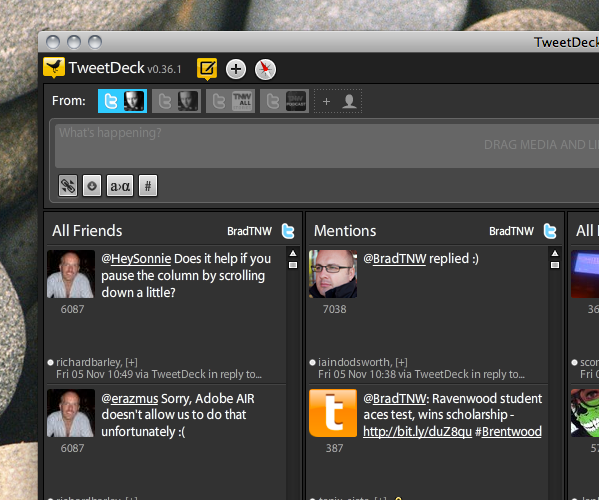 TweetDeck sees a growth explosion with latest version; has biggest day ever. Some great news for a great service. We’ve been watching the Twitter account of TweetDeck CEO Iain Dodsworth today as he’s been blown away by the response of people downloading the newest version of their software. It seems that we all scream for user streams. According to an email to TNW from Dodsworth, yesterday was TweetDeck’s biggest day ever in terms of active users over a 24 hour period, and today seems to be shaping up nicely as well. As Dodsworth was replying to our inquiry, he started by stating that there were around 6,000 people either on the TweetDeck site, or viewing the new splash page within the application. By the time he finished his 1-paragraph email, “…it’s telling us there’s around 6k people upgrading their TweetDeck’s right this second – actually now it’s 6,129”. We’re likely to see an update to the TweetDeck blog today, detailing the growth since the last release, so make sure to give it a click. Also, if you’ve not seen what the updates to TweetDeck can do, check out our video of what happens when you have real-time streams coming in from 6,000 people that you follow. API limits? No longer an issue with user streams. According to Dodsworth: “Real time streaming in new TweetDeck is extremely cool but did you realise there’s now no update API limit either”. Read next: Apple Introduces "App Store Hall of Fame." Top 50 Apps of All Time.